The head of a North Korean delegation visiting the South for an inter-Korean workers’ football friendly says the workers from the two Koreas will become a vanguard group in implementing the agreements reached during April’s inter-Korean summit. Ju Yong-gil, head of the General Federation of Trade Unions of Korea, made the remark during a joint press conference at a Seoul hotel on Friday, flanked by the heads of South Korea's two major umbrella labor groups. 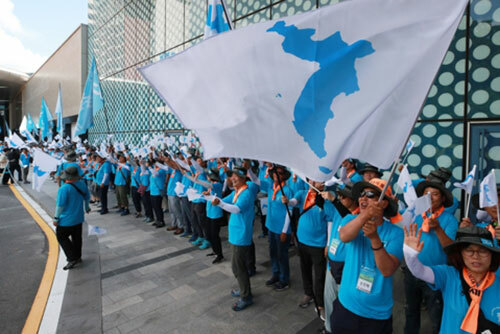 He said the football match will show the North and South Korean workers’ will to abide by the Panmunjeom Declaration, hoping it will build momentum for the unification of the two Koreas. The 64-member delegation, led by Ju, arrived in the South on Friday morning. They will join the South Korean workers’ representatives for a football match to be held at the World Cup Stadium in Seoul on Saturday. The game is the first civil organization-led event held since the Panmunjeom Declaration on April 27th.